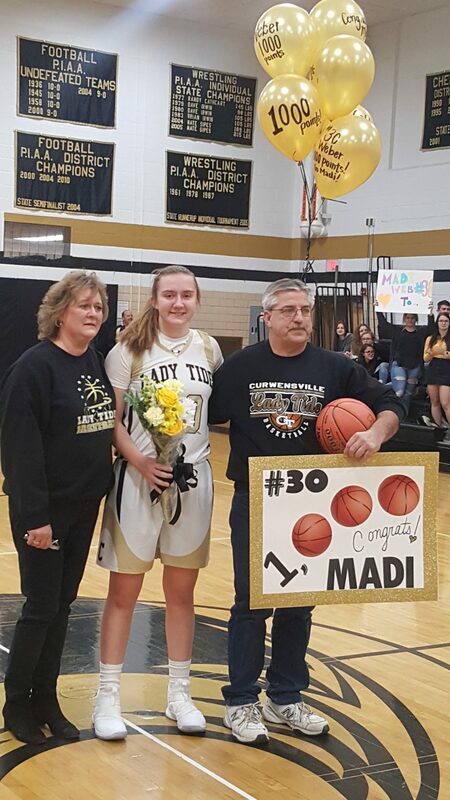 CURWENSVILLE — It all came together for the Lady Tide of Curwensville. One night after miscue after miscue cost them against DuBois Central Catholic, Patton Hall welcomed back the black and gold as they welcomed in the visiting Lady Owls of Harmony. In just one night of rest, it clicked. Curwensville took the opening tip, scored the first basket, and never looked back. In doing so, many monumental moments occurred. It was the first game all season where the Lady Tide held the lead from opening tip to final buzzer, and it was the first game they led in all aspects of the game. 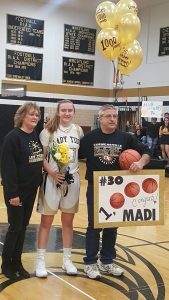 But, the cherry on top for this night, was senior Madison Weber having a career night, eclipsing the 1000-point mark in the 62-32 decisive victory. Head coach Bob Desmett smiled ear to ear in victory, and said afterwards he didn’t ask his team for much after last night. Curwensville got off to a quick start following a pair of baskets from Tarah Jacobson and Brianna Swindell. However, it was an early foul from Harmony that put the Owls in a bit of an early hole. That foul came from the sidelines not even three minutes into the first quarter, as head coach Sean McMullen argued a foul on his team while the Lady Owls had possession. When the ball was turned over he was still arguing the call, and the officials heard enough and threw up the technical foul, forcing McMullen to watch from across the bench for the duration of the game. Weber drained the pair of free throws that followed, part of a 15-7 opening quarter for Curwensville. “When you can get the other team frustrated, coaching staff and the bench, it helps us,” Desmett said of the early issues of his opponents. The second quarter was all about No. 30 as Weber inched closer, and closer, with each attempt. With just over five minutes remaining, she was one shot away from hitting four figures on her career. The first two attempts, one from the post and another inside drive, were just off the rim. But finally, with 4:16 on the clock, a drive down the lane finally gave her the moment she and the crowd were waiting on. A simple basket meant sacrificing a timeout, but all for the milestone that the senior center worked for. Weber’s night went even farther as she added another 21 points, accounting for a total of 35 on the night. She added in seven rebounds, six assists, five steals, and three blocks. Desmett felt the night was excellent for Weber, but it wasn’t just about her, but what she did for her teammates even en route to 1000 points. Curwensville put the game on ice in the second quarter, outscoring the Lady Owls 17-4, while only committing one turnover and forcing seven. Harmony had a small run going in the third quarter that saw the Lady Owls go on an early 6-2 run, but Curwensville fought back to even the eight minutes at 13 points each. The Lady Tide lost a pair of starters in the fourth quarter due to fouls as Jacobson and Hannah Condon finished the night on the bench, but were soon joined when Desmett took Weber out to a standing ovation. For the visitors, Hannah Smith led scoring with 10 points, while Tori Houser led on the boards with eight. Harmony lost the turnover battle, 30-14, including 12 committed in the final quarter. Desmett took in the moment as his team surrounded Weber for some photos, wanting it to be about them and not he as the coach. He did, however, acknowledge that the work wasn’t done, but it certainly would be a lot easier after such a night. That week begins on Monday when Curwensville (2-5) hosts Union, originally slated for this past Monday but was postponed due to weather. Tip is at 6 p.m. for junior varsity, varsity to follow at approximately 7:15 p.m.
Fry 3 0-0 6, Houser 2 0-0 4, Westover 1 2-8 4, Hoover 4 0-0 8, Smith 3 4-6 10, Brothers 0 0-0 0, Smith 0 0-0 0. TOTALS 13 6-14 32. Weber 13 7-11 35, Jacobson 4 0-0 8, Condon 0 1-4 1, McCracken 1 0-0 2, Wagner 1 0-0 2, Swindell 2 1-3 5, Witherite 0 0-0 0, Bakaysa 4 0-5 8, Henry 0 1-2 1. TOTALS 25 10-25 62.